The main body of trained rescue men consists of men employed at the pits who attend the local rescue stations for training. They are selected from volunteers, who have to meet a high standard of physical fitness. Even if still fit they are retired from the rescue service at the age of 45 years. The initial training and instruction of these men is carried out at the rescue stations in the lecture rooms, galleries and climatic heat chambers over a period of several weeks. Training is given in both compressed oxygen and liquid oxygen apparatus. On completion of the training, the men are incorporated into the pit teams and attend at the rescue stations for six practices each year, with a further two practices underground at local pits. There is a fairly high fall out rate due to the difficulty of some men keeping to the required standard of fitness. 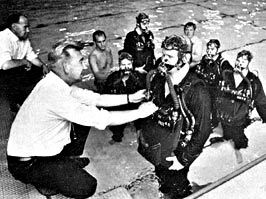 Several years ago it was decided to train a team of rescue men to operate under water in case their skill was needed in special circumstances. This team was based on the new Hednesford Rescue Station, where the superintendent was a trained under-water instructor. The team carried out valuable reconnaissance work at the Lofthouse Colliery disaster in 1973 when an inrush of water from old workings resulted in the loss of seven men and in serious flooding of the affected area. 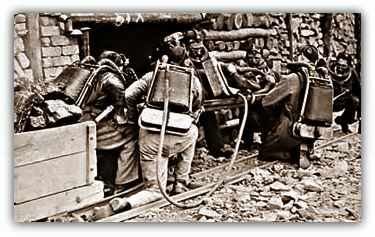 Arising out of this incident it was found that, although underwater swimmers, or frogmen, might be useful in certain circumstances, it was considerably more useful to have trained men who could walk through flooded roadways sometimes completely submerged, in conventional mines type breathing apparatus. Numerous teams of men wearing "Proto" apparatus carried out such missions at Lofthouse in most arduous circumstances with the result that it was decided to train large numbers of men in this technique. So far, more than 1,000 volunteers have undergone this training under carefully controlled conditions and such has been the enthusiasm that the non-swimmers have been as successful as the trained swimmers. Following an explosion at Lyme Colliery in Lancashire in 1949, two members of the Boothstown Rescue Station lost their lives due to carbon monoxide poisoning. The men were working in a high temperature and collapsed due to heat exhaustion, which caused them to lose control of their apparatus mouthpiece. Recognition was given to the six permanent Corps members for their conduct during this operation by the award of one George Medal, one BEM and four King's Commendations for brave conduct. Two of the awards were posthumous. These were only a few of the many awards which have gone to rescue men for bravery during the history of the service. The two who lost their lives were two of a sizeable number who have lost their lives in rescue work. This incident prompted more detailed research into permissible temperatures and time periods for rescue men to operate in hot and humid conditions. Most of this work was carried out at Doncaster Rescue Station in conjunction with the Safety in Mines Research Establishment and medical officers. A special chamber was built in which the temperature and humidity could be carefully controlled whilst men carried out specific tasks in breathing apparatus. There are now similar chambers at each rescue station and all rescue men receive practices in the chambers at regular intervals.